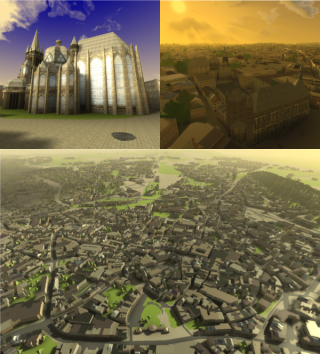 Virtual city models become more and more important in applications like virtual city guides, geographic information systems or large scale visualizations, and also play an important role during the design of wireless networks and the simulation of noise distribution or environmental phenomena. However, generating city models of sufficient quality with respect to different target applications is still an extremely challenging, time consuming and costly process. To improve this situation, we present a novel system for the rapid and easy creation of 3D city models from 2D map data and terrain information, which is available for many cities in digital form. Our system allows to continuously vary the resulting level of correctness, ranging from models with high-quality geometry and plausible appearance which are generated almost completely automatic to models with correctly textured facades and highly detailed representations of important, well known buildings which can be generated with reasonable additional effort. While our main target application is the high-quality, real-time visualization of complex, detailed city models, the models generated with our approach have successfully been used for radio wave simulations as well. To demonstrate the validity of our approach, we show an exemplary reconstruction of the city of Aachen.